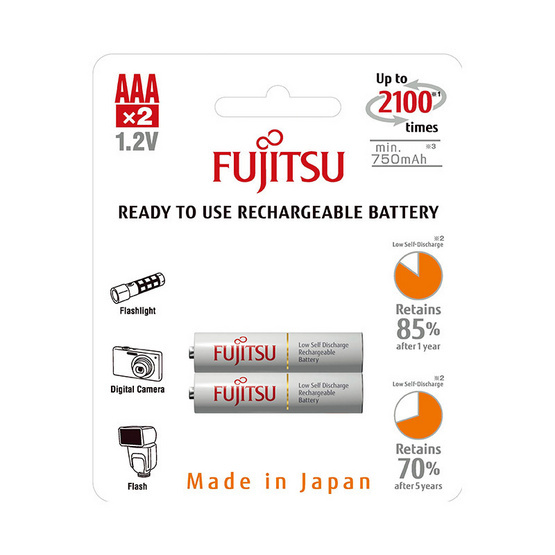 Fujitsu ถ่านชาร์จ HR-4UTCEX(2B) ขนาด AAA Pack 2 White Standard Capacity min 750mAh. Packaging Dimension (กxยxส) 9.5x11.5x1.5 ซม. FUJITSU WHITE STANDARD CAPACITY ready to use recheargeable batteries. The precharged Fujitsu White Standard Capacity is the perfect battery for everyday use devices that often need to be recharged, such as wireless game controllers, LED flashlights, radios, GPS devices, wireless mouse and other. When you run out of power, simply recharge it and continue to use your Fujitsu batteries. You can repeat this up to 2100 times, saving money and your planet in the process. Call Center โทร. 02-3021517 เวลาทำการ จ – ศ เวลา 8.30 – 17.30 น.
Fujitsu ถ่านชาร์จ HR-3UTHCEX(4B) ขนาด AA Pack 4 ก้อน Black Higt Capacity min 2450mAh. Fujitsu ถ่านชาร์จ HR-3UTHCEX(2B) ขนาด AA Pack 2 ก้อน Black Higt Capacity min 2450mAh.